The energy of the Taiwanese PGO industrial group was phenomenal; in 1972 it began building scooters, and it was exporting by 1988. 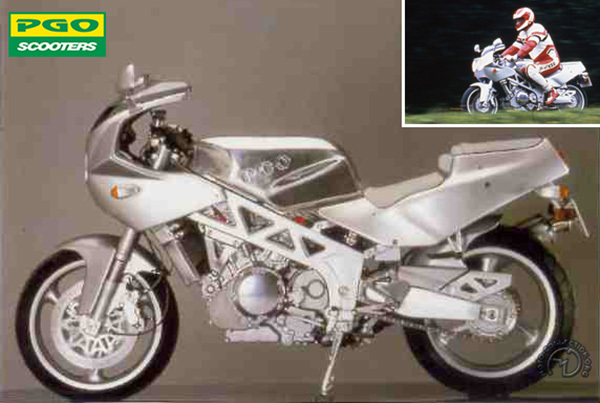 At the 1992 Cologne Show, the marque took the world by surprise by announcing, without any prior warning, that it was going to become a motorcycle manufacturer. PGO dove right into the deep end with the world's biggest production motorcycle. The sporty PGO was also a machine that could be used anywhere, and complementing the character of its engine with a deceptively modest power output allied to boundless torque ensured phenomenal pickup. Remarkably well-finished, with an all aluminum frame and tank, and as narrow as a single, the 1600 weighed just 452 lb dry. The highly original frame, with twin cast aluminum girder main beams, was entirely the work of PGO. However, the firm had been prudent enough to choose a tried and true power unit in order to avoid the gigantic investments required to develop an engine from scratch. The huge 1500cc V-twin from the Kawasaki Sumo 1500 was used as a starting point but practically everything on it was modified. The original bore and stroke (102x90mm) were changed, the engine mounts were shifted, the transmission was by chain instead of shaft and the original ignition system used three spark plugs per cylinder. Unfortunately this nice exercise was a show model only.